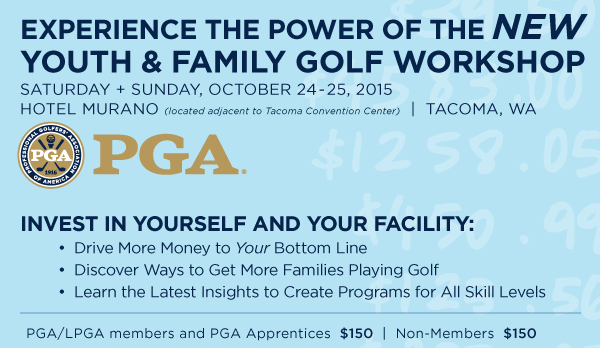 We are happy to announce details of the PGA Youth & Family Golf Workshop, brought to you by the PGA of America and Rick Murphy, PGA! The workshop will be held October 24 – 25, 2015 at Hotel Murano. This precedes the PNW PGA Merchandise Show. Earn MSR’s in PGA Education. Learn from industry leaders Bob Baldassari, Michael Hebron, Will Robins, Monte Koch, Glenn Cundari and Sara Griffin. Click here for flyer & full schedule. The Early Bird Price is only $125 for both days and includes dinner on the 24th. Register before October 9 to get the discounted price!